in a similar manner to our often confusing canadians with americans, i'm given to thinking that the phrase 'an englishman's home is his castle' could imitate the former incongruous behaviour and be, in fact, not pertaining specifically to the hypothetical englishman per se. alex salmond notwithstanding, scotland, wales and northern ireland are still intrinsic parts of the united kingdom, though many a johnny foreigner will insouciantly refer to an inhabitant of these parts as 'english', even if faced with a red-haired, bearded and kilted scotsman who constantly refers to them as 'jimmy'. so, for the purposes of homogeneity, we shall assume that, in this case, the term englishman' refers to anyone currently residing in any of the aforementioned distinct parts of the united kingdom. in which case, this castle performs several useful functions, not the least of which is providing somewhere appropriate in which to live. mrs washingmachinepost is beset by the tidy gene where she suffers from an uncontrollable need to put things in a safe place, never to be seen again in either of our lifetimes. possessed of an erratic memory, i have taken to leaving items that i need to take with me, on the top of my armchair, that i might recall this fact as i exit the sitting room carrying my computer bag. of course, by the time i have returned from washing my flowing locks and brushing my teeth, the aforesaid item(s) has been tidied away, and i leave the house without it/them. conversely, i have never set sight on this tidy gene, having acquired over the years an indefensible ability to leave piles of magazines, books, cycling clothes in any unpopulated corner of the house. thankfully, the bicycles that i own and those that visit for all too brief periods of time by way of review models have a bikeshed to go to. were this latter bicycle domicile not to exist, i would have created a fictional verisimilitude; you would surely think a great deal less of me were i to be without a bike shed. it is almost a professional necessity. however, there are many amongst the bicycling fraternity who are less well provided for. not every englishman's castle has a back garden with a shed, garage or lock-up, somewhere, in fact, to place a bicycle away from the elements. allied to that, unless you are fortunate enough to live far enough away from so-called civilisation, you might need to lock the aforesaid bicycle to something immoveable in order that it might still be there the following morning. there are, of course, galvanised and coated steel lockable boxes and more recently, moulded plastic containers designed expressly for the purpose of concealing expensive bicycles from view and shielding them from the elements. but even those need appropriate space, for most are designed to be bolted to the ground, the latter which might not belong to the englishman in his/her castle. truly it is a conundrum, but one that seems relatively easily solved by the pragmatically named and constructed bike parka. this nomenclature is something of a double entendre, so to speak, for not only does it allow for bike parking, but in a somewhat convoluted manner, it imitates a parka, at one time beloved of certain pupils at my former secondary school. never quite saw the attraction myself. 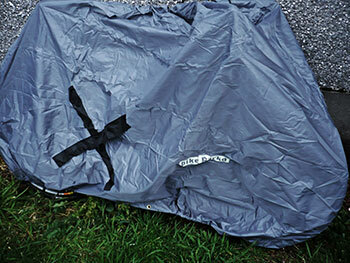 however, the bike parka consists of a particularly heavy-gauge ripstop polyester, similar to that of a quality tent and with accompanying uv fabric protection. 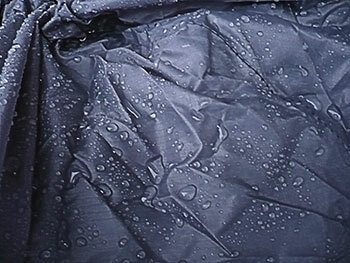 this fabric is as weatherproof as it comes; bicycles do not falter on any reduced degree of breathability, so the waterproofing is exemplary. the front and rear sections of the parka are elasticated and connected to an elasticated draw-string that exits the garment at the top via an adjustable toggle. it is a relatively simple case to fit the front to the extreme lower position of the front tyre before slowly and carefully hauling the rest up past the drop bars or flat bars, over the saddle and ultimately down to the extreme lower portion of the rear tyre. then simply pull tight the elastic cord and the bicycle is now excluded from the elements. i live on an island that is world-renowned for its fierce and often unpredictable winds, an element that is expert at finding weak spots in anything left outdoors. greg bourne, the man who has introduced this particular variant of the parka principle to the uk (the item originated in new zealand) said "It is very water tight so I'd recommend not letting the wind get under too much. Something will have to give in the end. That's either the bike taking off (it's happened before), or the fabric, if it gets thrashed about and catches on something sharp on the bike.". in the centre of the parka's hem, on each side is a sizeable brass eyelet through which i threaded a leather lace and fastened with a spring-clip. though this still allowed modest wind ingress, it certainly minimised the possibility of the whole enchilada emulating felix baumgartner's red bull balloon during the night. so far, so wind and watertight, but in this fashion, it would be but a simple matter to lift the parka covered bicycle into the back of an adjacent white van before heading speedily off into the distance, never to be seen again. 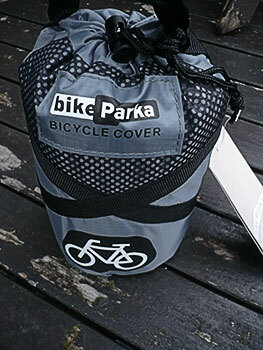 here's where the bike parka scores over any similarly formed bike parking solutions. 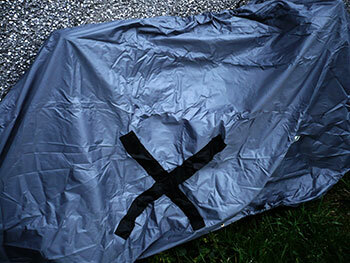 on each side of the parka is a large, reinforced cross pattern, interrupted by a velcro'd slot in the fabric. at this point, it is possible to pass a 'd' - lock through the rear wheel and incorporating the seat-tube, fastening the lock section to secure it to a lamp-post, clothes pole or any other immoveable object that might prevent its unlawful removal. unlawful removal of a bicycle has never been of major concern on islay, so i lived without this stage. in fact, that brass eyelet through which i had fastened a lace, could just as easily provide home to a small padlock, not only keeping the wind from demonstrable ingress but preventing easy and unauthorised removal of the parka from the bicycle. 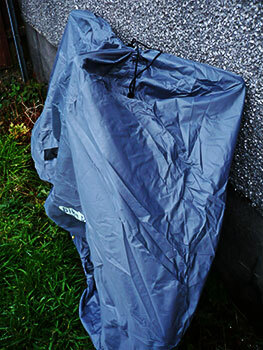 rather than take greg's word for its efficacy in the face of adversity, i opted to encase a review bicycle within the grey bicycle parka and leave it to its fate in the back garden. for on grass, no-one can hear you scream. though i am rarely in the habit of praising the weather islay receives at this time of year, for a period of seven days, it did me proud, alternating between horizontal and aircraft delaying rain, along with a couple of days of near gale-force winds. actually on one day it may well have been truly gale-force but so blase are we here on the edge of the atlantic, anything less than 50kph doesn't really count. in the manner of schrodinger's cat for those seven days it was merely guesswork as to whether the bicycle was still alive under that parka or not. the waterpoofing was amply demonstrated by the small pool of water that collected in the lake created by the triangulation of both brake levers and the stem. leave it for a couple of days, and it showed no signs of disappearing of its own accord. i think this might feasibly be considered a result. on removing the parka after an all too brief test period (one that will be repeated when the weather gets worse), the bicycle was not only bone-dry, but quite contented in its enforced isolation. the metal bits that one would have expected to show signs of ferrous oxide (yes, it happens that quickly over here; just ask the stem bolts on the shand skinnymalinky) were still as shiny as when they'd set foot on hebridean shores. in short, it appears that the bike parka did exactly what it said on the tin. well, stuffsac if we're being perfectly honest. that's where the second part of the fun started. having released the bicycle from its prison, it became necessary to pop the parka back into the stuffsac in which it arrived. it's worth my pointing out that this receptacle features neat little velcro straps to allow easy affixing to the bicyle's top tube or even to a rucksack or courier bag. the dilemma looming on the bikeshed floor was a very small stuffsac and a football pitch sized parka, the latter requiring to be placed inside the former. as it turns out, all you need is flexible fingers and a healthy degree of optimism; it will fit, believe me. the bike parka reviewed was the urban version (why is everything called that nowadays? i'm in the country and it still works), a more substantial option to the stash which lives without the velcro lock-through panels. the latter costs a most reasonable £29.95 while the model reviewed is ten pounds dearer at £39,95. if i point out that the bicycle over which the parka was placed would cost around £2,000 to replace for whatever reason, £40 is a most amenable amount to pay. while in the process of removing the parka, my next door neighbour mentioned that he had bought something similar in halfords recently, dragging it from his shed as he spoke. its price was a tad less than the bike parka, but the fabric appeared less than promising by comparison and it was without any hem eyelets or the lock through slots. i can assure you, there is no way i would have entrusted £2,000 worth of cyclocross bike to that which he held in his hands. i also smugly noticed that he was unable to fit it back into its zipped bag.